Source: U.S. Energy Information Administration, based on Ventyx Energy Velocity Suite, accessed August 2012. 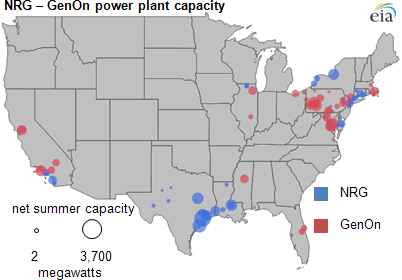 In late July 2012, the electric power company NRG announced plans to acquire GenOn, another independent power producer with assets in some shared markets, which would create a new company with 47 gigawatts of capacity in 21 states. The combined company would be the largest independent power producer in the United States, although the acquisition is still pending approval. Independent power producers are unregulated entities providing electricity into a wholesale electricity market or to another company that provides distribution to the ultimate customers. The recent Duke-Progress merger created the largest customer-facing, regulated electric utility in the nation. Regulated utilities own generation assets and provide electricity to ultimate customers. With the growth of the competitive generation market in the 1990s, several utilities spun off assets as separate companies that would operate as independent power producers (also called merchant generators). NRG was formed from the regulated utility Xcel Energy, and GenOn was formed from Mirant Energy, which was once the merchant arm of the Southern Company. Source: U.S. Energy Information Administration, based on preliminary data from form EIA-860 Annual Generator Report. Note: Data are preliminary and reflect total power plant capacity owned in whole or in part by electric power companies whose ultimate parent was NRG or GenOn as of April 2012. The new company will operate in the Texas, California, New York, and the Mid-Atlantic (PJM) system operator regions where it will make up 16, 15, 12 and 10% of net summer system capacity, respectively. NRG will seek approval of the Federal Energy Regulatory Commission (FERC) as well as the state utility commissions of Texas and New York. The company has also notified the California Public Utilities Commission, the Nuclear Regulatory Commission, the Department of Justice, and the Federal Trade Commission.